I’m in Washington, DC this weekend teaching a “Traveling with Your Sketchbook” workshop, and it’s got me thinking about how important my travel sketchbook has been to me over the years. I canʼt imagine taking a trip without it. My sketchbook is my trusty companion when I travel alone, and my retreat for some needed quiet time when Iʼm on the road with friends or family. In a later post I’ll talk more about the nuts and bolts of how to travel with a sketchbook, but first, let’s ask: How many of you have had the following experience? We are all our worst critics, and this is especially true with creative work. Somewhere in the back of our minds, there may be the voice of a parent or teacher telling you that “You can’t draw!” Or you may be telling yourself that, as you compare your sketchbook page with the perfection you see in your mind’s eye. Even if you feel like you “canʼt draw” or “canʼt write,” just jump in and try. Remember to focus on your experience, rather than how “good” your work is. Go ahead and be messy, art often is. The most important thing to remember is: there is no wrong way to do your travel journal—other than not use it. Your travel journal is a personal record of your thoughts, feelings, and impressions. You may find that you like to write more than draw, or make collages more than write. Any way you approach it, youʼre creating a personal record of your unique experience of travel. So focus on the process of looking around you, paying attention to your senses as you engage with a new place. Pay attention to all of your feelings, from exhausted to exhilarated, as you move through your days away from home. Use your journal to record what interests you—that’s the important thing. Drawing or writing in a public place gets easier after the first few times you try it. By the second day of being out and about with your sketchbook, you will probably be over the shyness hump. Most folks around you, busy with their own concerns and going about their daily routines, wonʼt even see what you’re up to with that pen and paper over in the corner. The few who do notice you drawing will be impressed by your creativity, rather than critical of the results. And someone is guaranteed to tell you about his Aunt Sadie, who “is also an artist”. If you want to be more inconspicuous, try wedging yourself into a doorway on a busy street, or position yourself at the edge of a group in a crowded market. If you stand in the middle of the sidewalk or right in front of a market stall, you’re more likely to draw attention. After a little practice, you’ll find you’re comfortable staking out your territory with your sketchbook. The best remedy for inertia, or the feeling that you don’t want to stop your forward motion and note something down in your sketchbook, is to always have your sketchbook in hand--that is, literally in your hand. If it’s in a backpack, where you have to think, “Is it worth it to pull that thing out?”, you probably won’t. Next best is to have your sketchbook and pens in a shoulder bag or coat pocket where they’re easily accessible. Anytime I buy a new purse, I take my sketchbook along to make sure it fits inside. We Americans are a fast-moving people, and frequently want to see as many “sights” as possible when we travel. 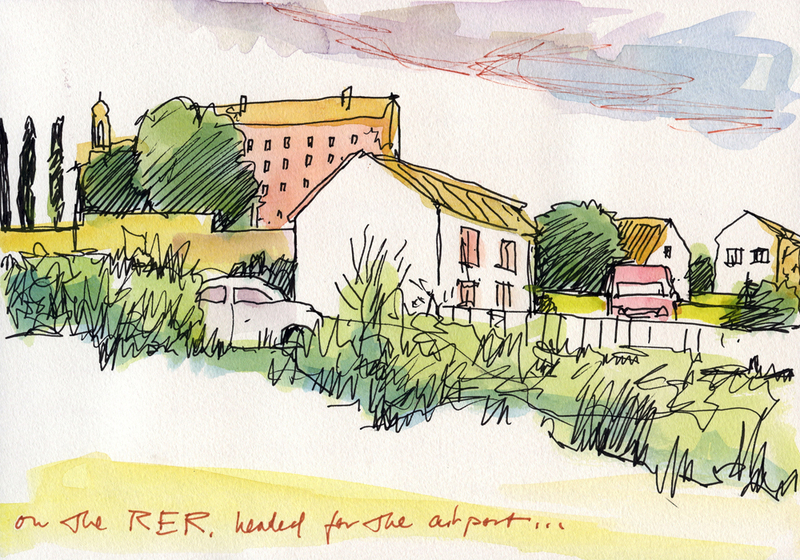 A travel sketchbook can serve the very useful purpose of slowing you down. Drawing and writing require you to digest what you’re seeing, to stop and record what you think and what you feel about what you’ve seen. Your sketchbook provides a welcome excuse to linger over a glass of wine in a cafe, or to dally in the sun on a park bench. Feel free to assert your need to stop and draw to friends and family, or even to your tour group. They may think you’re an oddball—but emphasize that you can be very cranky if deprived of sketchbook time. And believe me, no amount of time is too short to get a drawing or written thought down in your sketchbook. I’ve done sketches from moving vehicles and when walking down a street that took fifteen seconds. No matter how simple these few lines are, they always bring back a memory. An empty sketchbook can feel overwhelming, and you can sometimes, before you even begin, feel defeated by all those white pages . A good solution is to narrow down your focus to only those things that interest you in the place you’re visiting. Maybe you love food, or markets, or museums, or architecture—or dogs, shoes, or signage. As you go about your sightseeing, try going on a “treasure hunt” looking for your favorite things. Another possibility is to keep a chronological daily diary in picture form. Just note where you are and when you’re there, and a few observations about the experience. Don’t be shy about sharing both the good and the bad. 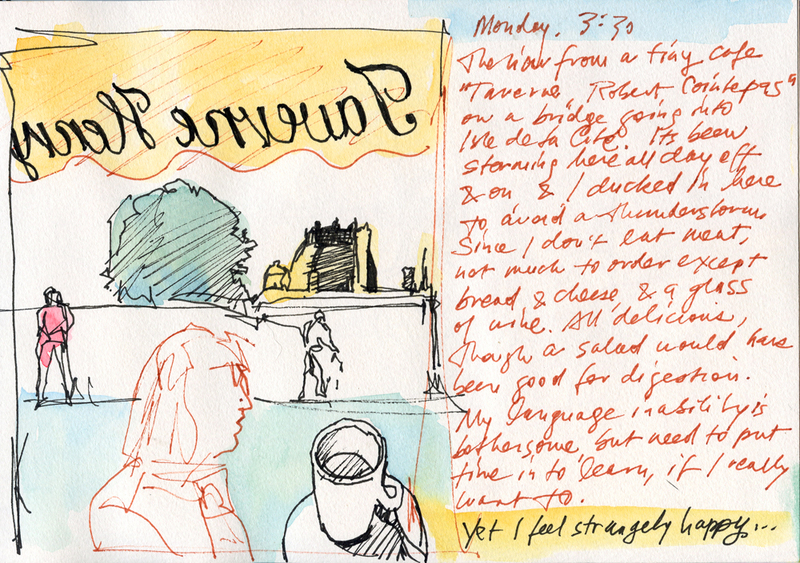 Travel can be both exhilarating and difficult, and honesty can make for a very engaging sketchbook. Another idea for a specialized focus, especially if you don’t want to do much drawing (though I’ll try to talk you into trying drawing in a later post) is it look for printed materials like entrance or transport tickets, stamps, or labels, and use them for a sketchbook collage. You can combine these visuals with a written journal, if you’d like. The point is, you donʼt ever need to draw a building or a person while you travel the world (or your neighborhood) if youʼd rather not. Permission granted to make your travel sketchbook your own. 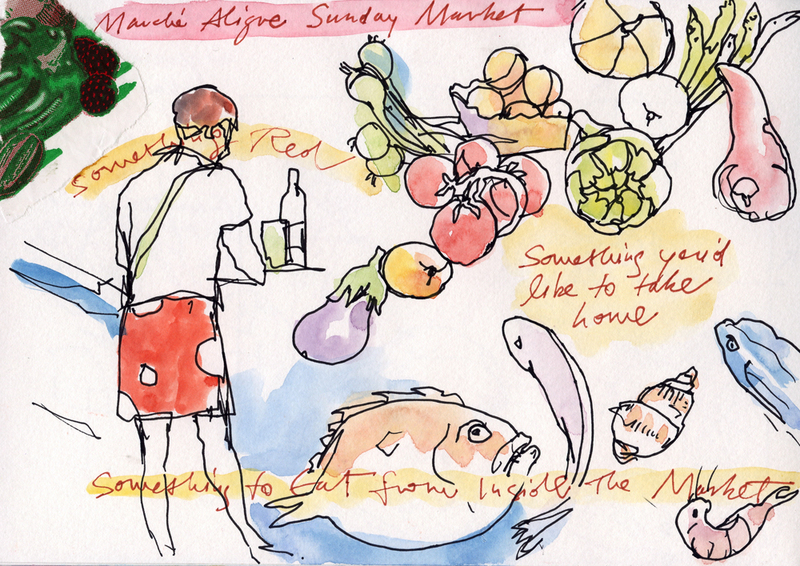 Wherever your journey takes you, whether Borneo or the corner store, make your sketchbook your close companion. It will turn you from a tourist to a traveler, and give you a whole new way to see the world. 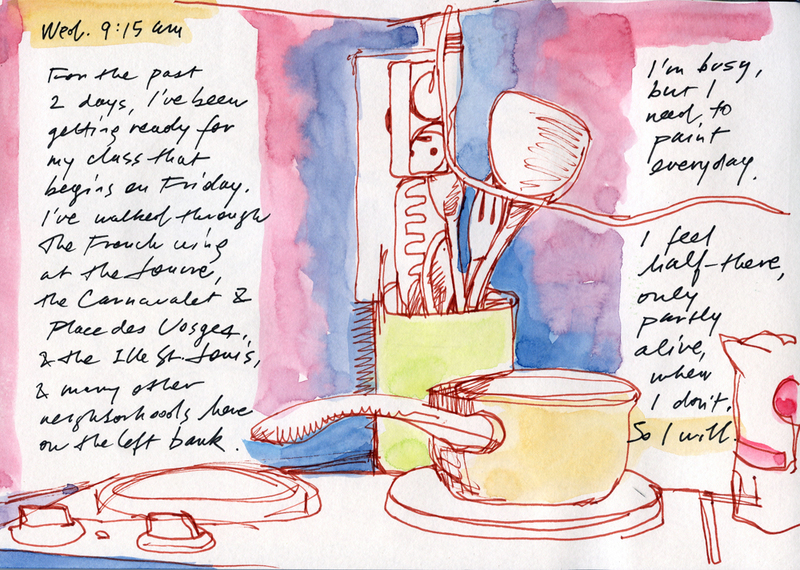 Do you have any thoughts to share on travel sketchbooks? Your comments are welcome below!